Mice deserve a vacation just like, and now you can take your mice to the beach with you! 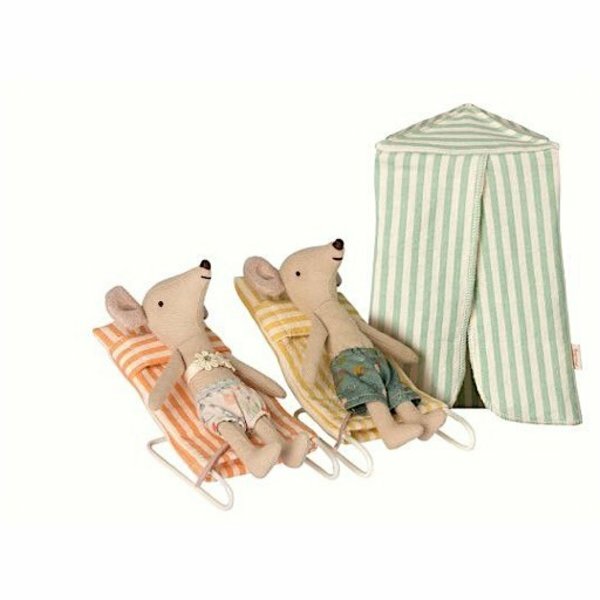 This adorable set comes with two mice wearing their bathing suits, two chairs, and a cabana. The mouse itself is made from high quality fabrics, from its cotton body to its detailed outfit. A precious little pocket-sized companion for your little one! Dimensions: Tent: W3.5 x L3.5 x H6 inches. Chairs: W2.5 x L6 inches. Mice: H 5.5 inches.